The chancel of the church was built in the 14th century onto an existing 13th century nave. The nave was rebuilt in brick in 1680, and the chancel was replaced in 1840. A west gallery was erected in the nave in 1770, but was removed again in 1931-32, at which time repairs to the roof and the south wall were being carried out. 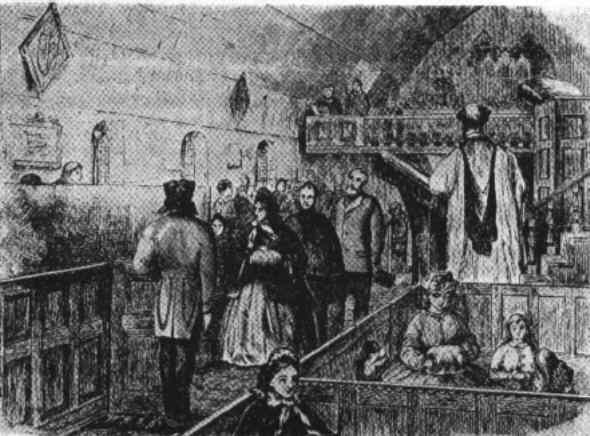 Above is a reproduction of an 1862 sketch of the interior of St Germain's church, looking west. It is taken from a drawing by Alice Mary Oliver (Mrs H Collingwood). It shows the west gallery in position, what appears to be a two- (possibly three-) decker pulpit, and box-pews of differing heights. At the front of the gallery are three singers with one book of music. Two adults, possibly a woman and a man, are sharing the book which she holds, whilst the third, a boy, stands slightly apart from them, looking down into the nave. Behind are probably three rows of benches with what appear to be (charity?) children, with a male figure with upheld right arm in which is a switch or cane. Bobbingworth, Essex, S Germain (GF), 6, 13-0-3 in F. Rung from porch.